A concert of three outstanding choirs in Falmouth on 23rd February will give a taste of the musical treats to come when the Cornwall International Male Choral Festival bursts across the Cornish scene from the 2nd to 6th of May. The Celtic Ensemble, Cornwall Boys and Huntington Male Voice Choir will be singing at Falmouth’s All Saints Church, which will also be one of the 40 Cornish venues hosting more than 50 concerts and events by 60 choirs of all ages and nationalities in the largest Festival of its kind in the world. 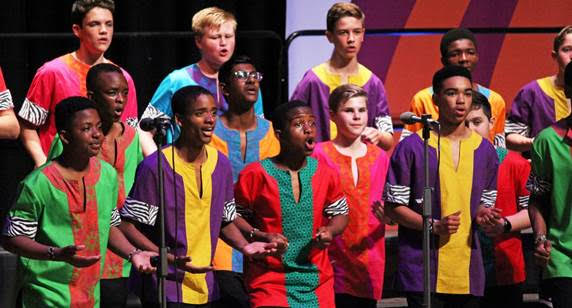 Among the international singers travelling to Cornwall for the Festival in May will be boys from a South African Methodist college who will also be making a voyage of discovery about the heritage of their school: St Stithians College near Johannesburg was named after the 1859 birthplace of one of its benefactors - Albert Charles Collins originally of Stithians, Cornwall. During the Festival they will be singing alongside their namesake St Stythians Male Voice Choir, one of 28 Cornish choirs taking part in the event. “So many international choirs have strong links with Cornwall,” says the Festival’s Artistic Director Gareth Churcher. “Just as the 19th century Cornish miners and their families took their skills and technologies across the globe, so they also took their vibrant music and culture. As well as South Africa, international choirs will be travelling from Australia and Canada, Russia, Lithuania and Croatia, Finland and the Netherlands, while another 22 choirs will be descending on Cornwall from England, Scotland and Wales. This is the ninth biennial Festival and the event has rapidly grown in stature and reputation on a world stage. The 2017 Festival was a huge cultural and economic success for Cornwall with more than two thousands singers performing for more than forty five thousand people in venues from the Minack Theatre to St Michael’s Mount and from Mevagissey to Bude. British composer, conductor and singer Bob Chilcott – himself described as a contemporary hero of British Choral Music – says the Cornish event, “has become a vital part of the choral festival landscape here in this country. It is an important showcase for choirs from all over the world and gives strong voice to this genre of singing. I am very happy and honoured to be able to show support for the great work of this festival." The big change this year is that owing to major building works at the Hall for Cornwall, Truro Cathedral will be hosting all the international concerts and competitions which have previously been shared with HfC. Full details of the 2019 Cornwall International Male Choral Festival including films and photos from previous events can be found on the Festival website www.cimcf.uk. Festival concert tickets will be going on sale on 1st March 2019 via the CIMCF website and also Cornwall Riviera Box Office – www.crbo.co.uk - which also has information about its local box offices within various Tourist Offices around Cornwall. Tickets for the All Saints Church concert at 7.30pm on 23rd February cost £8 (or free for under 16 year olds) and can be bought on the door. Photographs – all free to use – a picture credit for Phil Monckton much appreciated. The Festival was inaugurated in 2003 and is held every two years. The Festival is a non-profit making company, limited by guarantee and is a registered charity. It is supported by its patrons, sponsored by a wide range of local businesses and helped by more than 400 volunteers - to each of whom the Board is sincerely grateful. Gareth Churcher - director@cimcf.uk / 07584 296961.